Online Extravaganza! Underway now, this SALE is Fantastic! Happy November to all my Fancy Stampers. Things have been quiet here, I've been concentrating a lot of my effort on my Facebook pages and groups to see if the audience is more populated there (it is!) so therefore, been posting less here where there are very few readers so far. If that matrix changes I'll be posting a lot more here so stay tuned if you are an avid follower on Blogger. 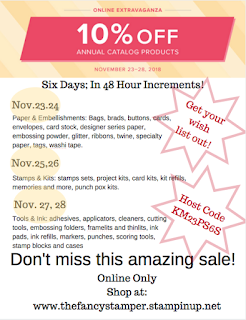 The latest news is that Online Extravaganza is well underway with 10% off most everything in our catalogs!! 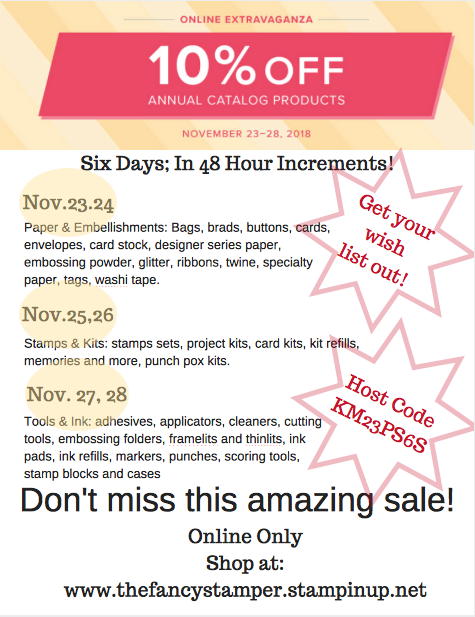 The way Stampin' Up runs this is they do the sales in 48 hour increments. The first 48 hours (just ended) were embellishments, ribbon, and most paper. Believe me, I stocked up for that one!! I also strongly encouraged both my team members (fellow demonstrators) as well as customers to take advantage of the savings. The next 48 hour sale (just started) has most stamp sets and kits on sale currently. I really recommend getting your selections EARLY because they must limit qualities so that they will not run out for the rest of the year. Once their quantities are depleted the item will not show up as "on sale" anymore but will revert to its regular price. It is well worth the effort to go NOW to see if you can get a portion of your wish list purchased at a great discount. The last 48 hour sale will begin on 11-26 (midnight) so get ready for that as well. Each of these sales is separate and you will need to complete each order before the sale period is over to get the prices listed. Please contact me for more details or if you have any questions before ordering. This is a flyer I made for my customers to help them understand the sale a bit better. On that note I should go and finish preparing my last online class that will be mailed out tomorrow. If you were one of the recipients I'll be sending you a tracking number so you can see when your packet will arrive. If you didn't get in on this class, make a note for next month's class. The classes generally close around the second week of the month and the packets are then ordered and we mail them out to your around the third week of the month. My detailed online video tutorial link will accompany the packet so that you will have step by step instructions on how to re-create my class projects as well as all the supplies needed to do so (except for basic crafting tools like scissors, adhesives, etc.) 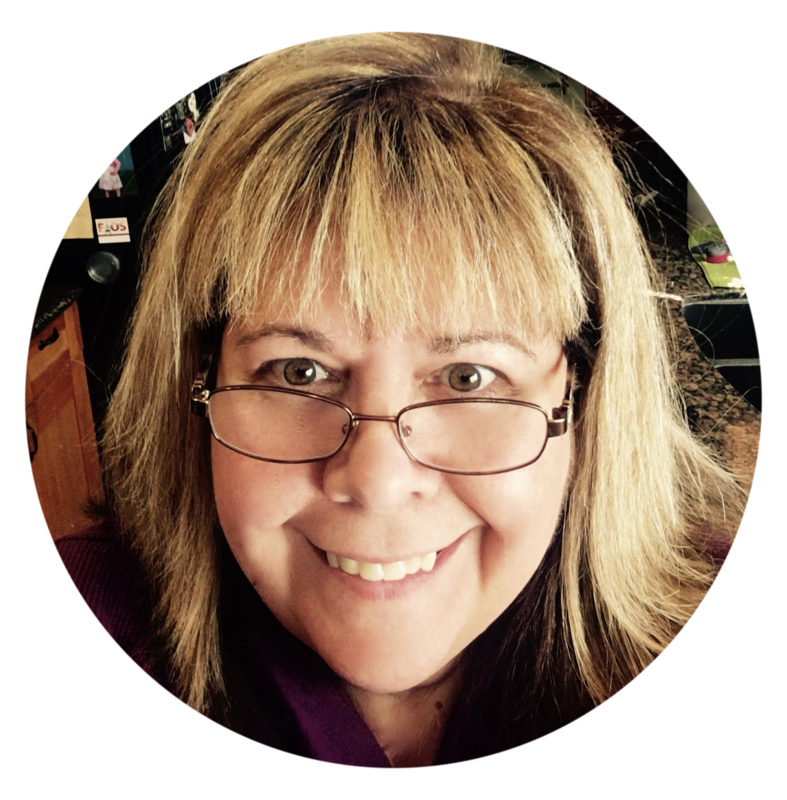 Join us for December's online class! Head over to my 24/7 shopping page to see all my upcoming events and see what best suits your needs. 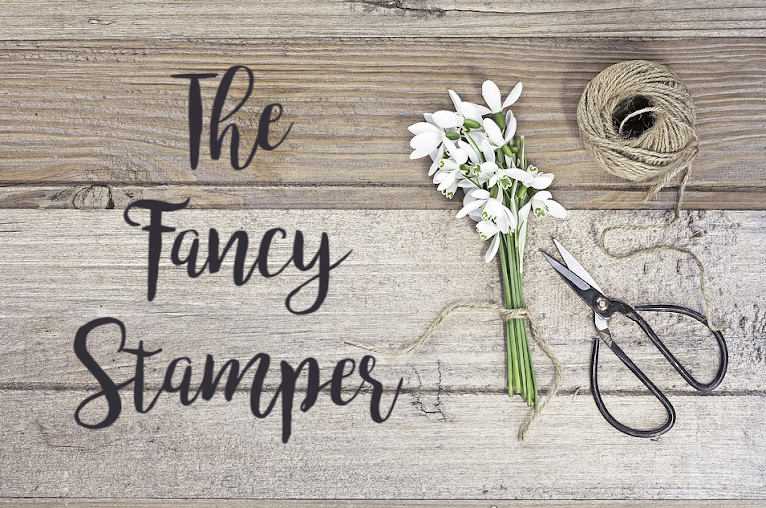 www.thefancystamper.stampinup.net. Have a great Sunday and I hope to hear from you soon!